Microsoft launch Xbox One in India yesterday midnight. The much awaited gaming console available exclusively on Amazon India, as it also on pre-order started on website before the launch of the console. So if you pre-booked your console then your chances to get your hands on quick as stocks are very limited and maybe stock-out soon. 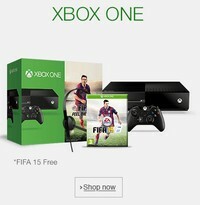 Buy a Xbox One video game of your choice with a free ₹4,000 Amazon.in Gift Card. Play amazing exclusive games such as Forza Motorsport 5, Ryse: Son of Rome, Kinect Sports Rivals, Dead Rising and many others. 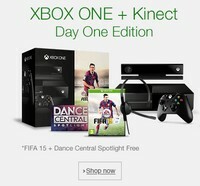 Kinect has been completely re-engineered to take full advantage of all that Xbox One can do. It’s more precise. More responsive. More intuitive. Its unparalleled voice, vision, and motion technology lets you reach into games and entertainment like never before. Automatically sign in when you enter the room. Accelerate through a game with subtle gestures. Or navigate through your favorite TV shows with the sound of your voice. It’s an entirely new Kinect for a new generation of entertainment.